The family behind such popular chains as Panera Bread, Pret A Manger, and Krispy Kreme has uncovered a past that has left them disgusted and ashamed. It seems the founder of the German based company has a Nazi past that came to light in a four page tabloid expose. While one might typically ignore tabloids as being salacious, in this case they knew what they were talking about. According to “NBC News,” in the original article about the history of the Krispy Kreme founders, it was uncovered that Albert Reimann Sr. and his son used forced labor of French and Russian people during World War II. However, that is not all that was revealed about the founders of Krispy Kreme, as it was also determined that the father and son duo were avid Hitler supporters and were vocal about being anti-Semitic. Not only did the Reimanns use forced labor during the war, but they also made donations to the SS military, meaning if they did make these donations, they were actively supporting the Nazi party and Hitler’s agenda. 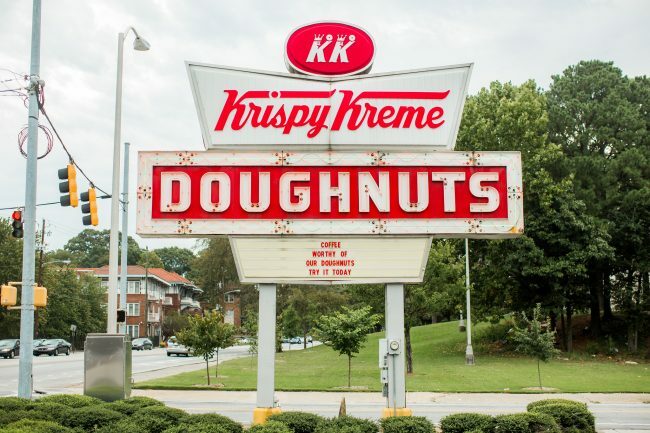 While the expose in the tabloid is news to the world, it is actually not news to the owners of Kripsy Kreme, who were first clued in to their family history back in 2014. When they learned about the family’s Nazi past, they reached out to a history professor in order to uncover the truth. Over the course of more than three years, research was done to determine what the truth was. A few weeks prior to the tabloid breaking this news, the family was presented with all of the evidence that the professor was able to dig up, which confirmed that Albert Reimann Sr. and his son were in fact affiliated with the Nazi party. In an effort to not only separate themselves from their company’s Nazi past, but also make amends for those actions, the company behind Krispy Kreme has vowed to make an $11 million donation to charity. At this time, they have not stated what charity would be the recipient of this generous donation, however it is believed that they will choose a Holocaust-related organization in an effort to right the wrongs of the past. Krispy Kreme might be a donut shop, but it has a large following that will likely not take kindly to learning the truth of the company’s past. It is unclear how this revelation will impact business for Krispy Kreme or any of the other businesses founded by the family. For now, the fact that the company is making such a generous donation is a step towards making amends. Now it is about seeing if Krispy Kreme’s reputation withstands its Nazi past.